Sorry for this short hiatus. Am not keeping well for sometime and this time its my wisdom tooth which has kept me busy for all the bad reason. Just went through a very painful surgical extraction of the teeth today and the pain is excruciating. Hubby gave me two offers, either to cry in pain or just sit, chill and do whatever I want to with my laptop, while he warms up the dinner and takes care of the baby. I chose the second and here is a quick post to prove my point that Bengalis cook many dishes with coconut other than the famous chingri malaikari. 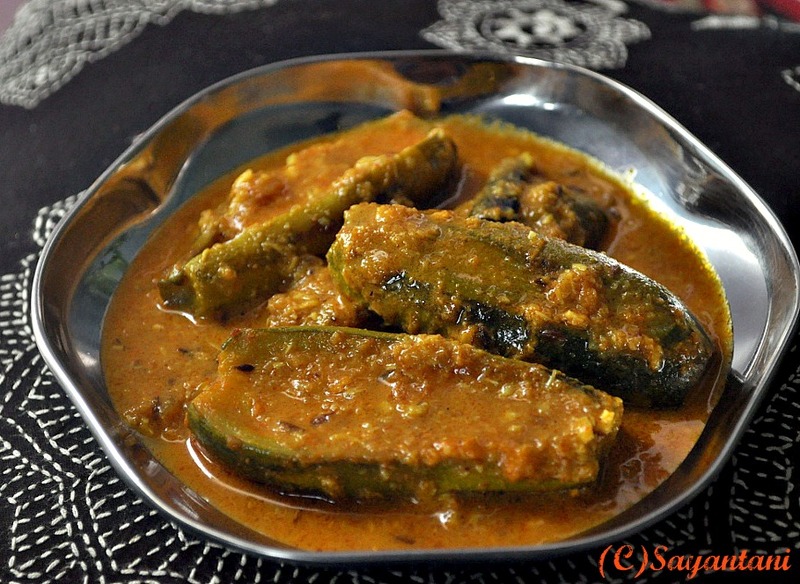 This pointed gourd dish is called Patal-er Korma and is a satwik dish where no onion or garlic is used. Like any gravy cooked with coconut milk this light, creamy and slightly sweet gravy is the winner which I prefer to cook when guests come over during summer months. When served with basmati rice, lentil and other light side dishes this promises a very satisfying yet light summer meal. Apart from the packed coconut milk I try to add little freshly (or frozen if you think that is good. I never used so have no idea.) Scraped coconut for added texture. Though the recipe is very easy but fresh ingredients make all the difference. For this dish choose tender pointed gourds which will soak the flavours well. I prepared this when a few friends came over from Bangalore. Please forgive these bad pictures, it was 4 in the evening when I finished cooking and the guests were about to press the doorbell. What a difficult life we food bloggers have. phew!!! Wash the parwal, trim the edges then peel skin at 2 or 3 places lengthwise. Cut them in half lengthwise. Smear little salt and turmeric and keep aside. Mix the cumin-coriander powder and ginger paste with ¼ cup water and set aside. 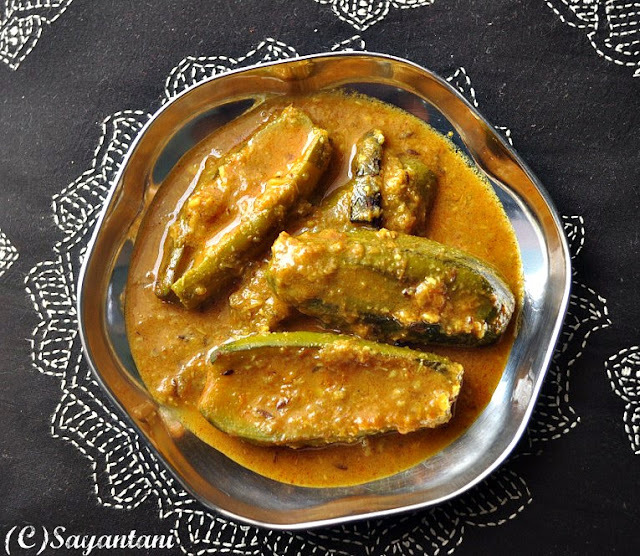 Heat 1 tbsp oil and fry the pointed gourds lightly or till they are golden in colour. Take out and keep aside. Add rest of the oil and once its hot add the cumin seeds, lightly crushes whole cloves, cardamom and cinnamon stick and slited green chilies. Once they start to splutter add the spices mixed with water. Add salt, turmeric and start cooking it on low flame till the oil start to ooze out at the sides. Approx. 3 minutes. Now add the coconut milk and same amount of water. Mix, cover and let it come to boil. Add the fried pointed gourd and check the seasoning. Add the freshly scarped coconut and let it get cooked in the creamy gravy for another 6-8 minutes or till the gravy reduces and the gourd becomes fork tender. The gravy should be thick, creamy and should coat the vegetables beautifully. Serve with rice, lentil and other dishes of your choice. If you like you can also add finely chopped onions to this dish. Fry them briefly before adding the spice mix. Sometimes I also add lightly fried cashews to the dish along with a few pre soaked raisins. this gives it beautiful texture. ABC series gourds at Ramya's Recipe. Patal, Patol, patola, patala, parwal, pointed gourd, gourd, Bengali patol recipe, bangali patol recipe, bengali recipes, banagli patoler tarkari, patol er dalna, pataler dalna, alu pataler torkari, tarkari recipe, bengali tarkari recipe, alu patoler dalna recipe, bengali style pointed gourd recipe, pure veg recipe, satwik recipe, vrat recipe, brat recipes, no onion garlic recipes, pure vegetarian recipe, what to cook with pointed gourd, light summer recipe, light curry recipe for summer, perfect summer recipe with coconut, coconut gravy recipe, bengali coconut cream recipe, perfect summer curry, how to cook light dish for summer, best summer vegetable curry, summer gourd recipe, mild summer side dish recipe, indian side dish recipe, bengali side dish option, vegetable parwal, alu parwal, parwal ki sabzi, aloo parwal, parval, parwal recipes, parwal sabzi, parwal english, vegetable parwal. I have never cooked parwal. I should now! wow looks so delicious will try sometimes. 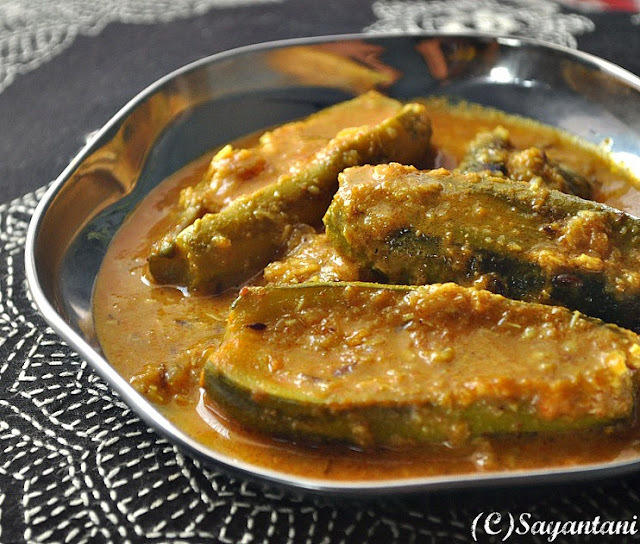 My favourite parwal.. and a new dish to try..loved the recipe!! mmmm!!!! n the table cloth is also awesome.. did you make that? Delicious looking korma. Just about to try this one out this weekend. Delicious! This is something that I know will click with my family. The Korma is too tempting to resist Sayantani...Truly yummy. This looks delicious.I have had that kind of surgical extraction done and I know how much it hurts. Hope you get better soon... take care! Korma looks super delicious and irresistible. Sayantani tomar blog ta aaj accidentally discover korlam. Khub bhalo kaaj korchho, please keep up the endeavor! Would it be possible to link your blog with facebook please? That makes it a lot easier to follow! Good luck with your health, hope you feel better soon! this korma looks mouthwatering. I am feeling hungry right now. This looks so inviting Sayantani..had parwal recently when I made masale bhaat at mu puja...love this preparation. Bookmarked!! @Travellermom, thanks a bunch for your comment. facebook page last month ei korechi, button ta top left e peye jabe. hope you like it too. Can imagine the taste,gravy looks so tempting. How are you? Wonderful dish from you ( as usual) ..Just finished all the patol by making stupid patol bhaja , else wd have tried this one ! Oh, I didn't know parval was called pointed gourd! The korma looks yummy and ur effort to post this make me admire u more. Get well soon dear. I have a tough time taking out time to keep my blog going and am left with very little time to go blog hopping.I was glad to see your comment on my blog. I am sorry to learn about your wisdom tooth, I know how it feels for I went through it all, but one good thing came of it I was old to have loads of ice-cream after my operation. This particular recipe of potol is something new for me, unfortunately the Kolkatta potols are just not available in Bombay this season would love to try thi one. Hope you are feeling better now...Will try this parwal dish today, just bought them.. This dish looks so good...hope you are feeling better. Oh Sayantani I hope you feel better soon. Tooth ache is the worst pain ever. Good that you got the tooth extracted and now on things can only get better. I have to say even in all this pain you cooked such a delicious meal. I have never cooked this vegetable in coconut milk, and have this recipe bookmarked.Take care and Hugs !!! What a delicious vegetable korma, looks so yummy! Hope you're feeling better now! darun hoyeche dekhta... have to try this version with coconut milk. are ki darun lagche dekhte!!! !kotodin je potol khaini !!! !potol jersey te ekebare dekhtei pai na !!!! Thank you for this wonderful recipe! Reminded us of our Mayapur trip and the Potol sabji we tasted there! Loved your recipe! We were reminded of our Mayapur visit and a similar sabji we tasted there! Thank you very much! This is one of my favorite since childhood. My mom use to cook this. But she do not cut patol, rather my mom use whole pointed gourd. Thanks for sharing this.